July is National Ice Cream Month. If you've figured out anything about semi-real national food holidays, you should have figured out they're worth honoring because it usually means free food. National Ice Cream Day is July 16 and there will be more free ice cream than you can cram in your craw. However, before you get there, your sugar addiction will thank you for stopping by any Baskin Robbins on July 14. For National Ice Cream Month, the sweets shop is handing out free slices of Polar Pizza from noon to 5 pm. Polar Pizza might sound like delicious leftovers from last night's delivery, but it's cookies and ice cream, which is just as good. 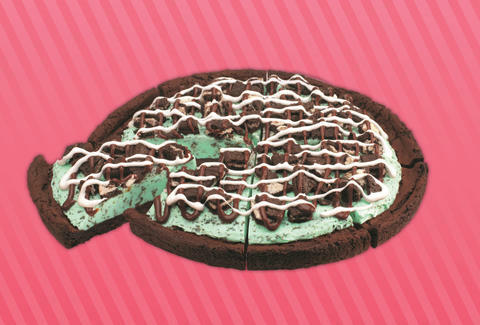 In particular, the chain is handing out slices of its new mint chocolate chip polar pizza. This summer delight has a double fudge brownie crust and mint chocolate chip ice cream covered in Oreo cookie pieces, fudge, and marshmallow topping. That sounds good, but even if it's not your thing, it doesn't pay to be as picky as "Weird" Al Yankovic when the ice cream is free. Baskin Robbins will also offer deals via its mobile app throughout the month.